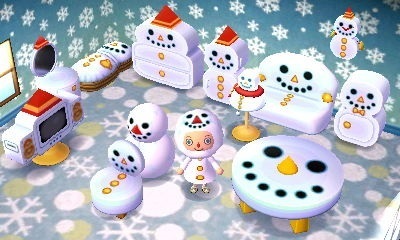 Creating snowmen has been a fun and endearing part of the Animal Crossing series since the very first game. New Leaf is a significant upgrade to the series, and with it came three new snowpeople who reward you with some nifty new presents. As before, the game rewards you for creating perfection, so it still isn’t a simple case of throwing two snowballs together. There are a few tips and tricks to learn, and also some rewards to be obtained for creating terrible snowpeople. Of course, knowledge is key to making the best out of the snowy winter season, and for all of this to happen you need some background information. The snow season starts in the last week of November and lasts until the 24th of February . During this time you will never see it rain in your town, and will instead see snow falling on some days. The music will also change slightly during snowy weather to a more wintry feel, with glockenspiel and tambourine sounds replacing some of the usual sounds. 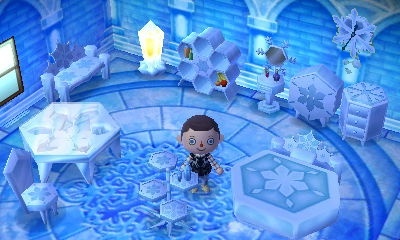 Veteran Animal Crossing players are quite familiar with the white blobs that float from the sky during the snow season; however, in New Leaf you should look more closely. Are there any particularly large and detailed snowflakes that stand out? These are special snowflakes, and catching them can be difficult because they are small and camouflaged against the snow. In addition, they are accompanied by a twinkling sound and can often be found at the beach, where they’re also easier to see. Special snowflakes act like a flying bug and, just like bugs, in order to catch one you must use a net. A regular net is available from the Nooklings’ store, Nat at the Bug Off tourney, or Isabelle when you first start your town. A silver net can be bought if you have a Museum Shop and have donated enough bugs. Special snowflakes are important only to Snowmam. 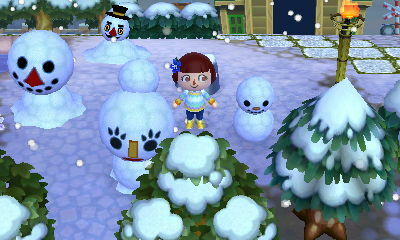 However, none of the other snowpeople can be built until snow settles on the ground and snowballs appear in your town. Unfortunately, that doesn’t happen until the 11th of December . 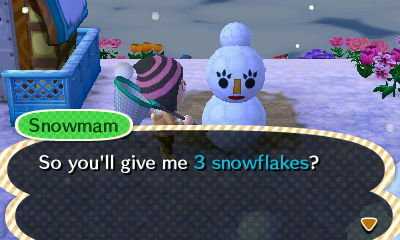 Since special snowflakes can only be kept in your pockets, and can’t be placed in drawers or in a home, if you choose to catch any when Snowmam isn’t in your town, your best option is to sell the snowflakes in Re-Tail for 500 bells each, or throw them away. In order to make snowpeople, you need two snowballs, of course, but where and when can you find them? From the 11th of December until the 24th of February the snow flurries finally settle on the ground, and your town will be carpeted in crunchy white snow. At the same time two snowballs will spawn daily in your town in random locations outside. You'd better get your snow boots at the ready because you’ll need to trudge through the town to find them. There are two things to note first. 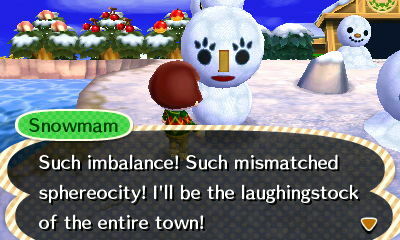 Snowballs only appear when your town is closed to Wi-Fi visitors and also snowballs won’t appear when visiting dreams in the Dream Suite. A snowball starts out small and you can only move it by pushing it with your player. Steering is difficult at this stage so you’re advised to move slowly. When a snowball gets to a certain size, you’ll be able to control it with your hands and steering will become much easier. 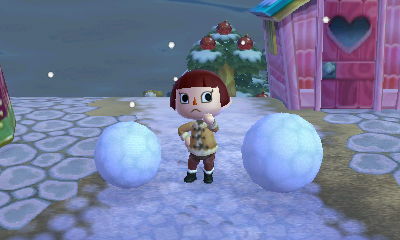 Rolling the snowball in snow will make it bigger whilst rolling it on dirt or on cobblestones will make it smaller. Flowers are no impediment, and you can roll your snowball right over them. Snowballs should be treated carefully as they are not indestructible. Attempting to move a snowball between fixed and tight spaces such as rocks, buildings, trees and Public Work Projects (PWPs) may cause it to break. A snowball should also be maneuvered carefully near rivers, ponds, and cliffs. This is especially advisable when it is small and hard to control, because one small error… and plop! It’s gone! It’s also important to keep villagers away from a snowball, and to scare off any dung beetle that may be trying to steal it. Should you lose a snowball, don’t despair. Entering and exiting a building will cause a replacement snowball to spawn elsewhere in your town. It is worth remembering this nifty trick because sometimes a snowball can be in a difficult location, and it may be worth deliberately dropping it off a cliff, or into water, so that you can then enter and exit a building to have the snowball spawn again in a more favorable location. Once you’ve found two snowballs and steered them close together, beware! Don’t allow the snowballs to get too close because one will automatically jump on top of the other and you may not yet be ready to make the snowperson you intended. So read on to find out what’s in store. One snow person can be created daily, and each snow person will survive for four days, including the day it is created. Therefore, the maximum number of snow people you can have at any one time is four. This means you can have the entire family on display if you choose to build a different type of snowperson each day. However, that isn’t always ideal and choosing which type of snow person to build may depend on other factors covered later in the guide. 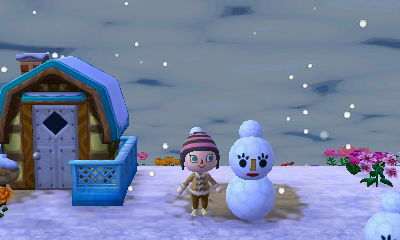 Interestingly, if you create a snow person in the last days of the season it will still remain until the four days have passed, although it won’t be functional anymore. The end result? You’ll have a snow person without there being any snow! Snowpeople can be assembled in the same type of places that bushes can be planted. Just like bushes, they can’t be placed on cobblestones, but can be built right next to each other and next to a building or a PWP. However, if you create snowpeople next to buildings or PWPs they will have disappeared after you’ve entered and exited a building, or once you have saved. If this happens, you will have lost the opportunity to build a snow person for that day. This is because once you’ve assembled a snow person no more snowballs will appear on the same day. If you’re unsure about the placement of a snow person then try entering and exiting a building. If after you’ve done that, the snow person has disappeared, you might consider quitting, without saving, and trying again in a better spot. 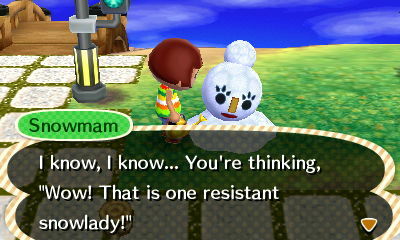 Even if the snowperson is still there, it is still not a guarantee that they will remain for the full four days because a new villager could move into your town and their house may just squash your snowperson. 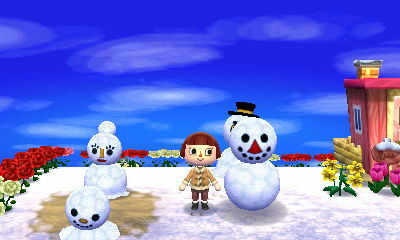 Unlike previous versions of Animal Crossing, in New Leaf it can be important to keep your snowpeople available for their entire lifespan. One of the tried and tested placements for the assembly of snowpeople is near, but still outside of, a cobblestoned area. Snow people can only be assembled from snowballs that can be pushed with your hands. This means the snowballs must be larger than the size at which they can only be kicked around. You need two snowballs to make a snowperson: one for the head and one for the body. Although you need to push one snowball on top of another to make a snowperson, each snowperson requires specific sizes of snowballs. Any two snowballs large enough, and in close proximity to each other, will result in one snowball automatically jumping on top of the other. Be careful not to get the two snowballs too close until you are happy with them, or you’ll end up with a snow person you didn’t intend to create. The size of the bottom snowball, whidh will become the body, determines which family member you’ll create. To help you achieve the correct size for the body, you can use your player as a measure. Stand to the side of the snowball, ensure you aren’t wearing any headgear and can see your ears, then look upwards. With your player standing next to the snowball body you can see the height of the snowball. In addition to creating four different types of snowpeople, each snowperson can also be made in three different qualities. The qualities are not officially named by Nintendo, and have been discovered through gameplay research. To distinguish between these three qualities, in this guide they have been named Perfect, Passable and Terrible. Use the following table to achieve the correct height for the body of each snow person in order to make Perfect versions. You can also use the table to find out how to create Passable and Terrible versions too. Please note that there is likely more than one way to create Terrible snow people, but the following table shows just one method. Body should be as large as possible and reach just above ear level of your character. Head should be slightly, but noticeably, smaller. Body must reach the ear level of your character. Head should be slightly, but noticeably, smaller. Body should reach to just above chin level of your character. Head should be slightly, but noticeably, smaller. Body must be below chin level of your character. Head should have just reached the stage where it can be controlled by the player. Body and Head should be as large as possible. Body and Head must reach the ear level of your character. Body and Head should reach to just above chin level of your character. There is never a need to make a Passable Snowtyke but, if you wish to, both the Body and Head must be below chin level of your character. Body should be as large as possible. Head should have just reached the stage where it can be controlled by the player. Body must reach the ear level of your character. Head should be as large as possible. Body should reach to just above chin level of your character. Head should be as large as possible. There is never a need to create a terrible Snowtyke but, if you wish to, then the Body must be below chin level of your character and the Head should be as large as possible. Snow people can be built in three different qualities and you’ll know which quality you’ve achieved after you’ve built them because they aren’t shy about telling you. A Perfect one will gush with praise and either reward you with a present in the mail the next day or engage you in one of several activities. A Terrible snow person will be incredibly angry at you, and a Passable one will neither praise you nor be upset with you. All the rewards in the game from Snowman, Snowboy and Snowmam can be acquired with building Perfect versions. To receive gifts from Snowtyke he must be built perfectly, but his gifts require that some or all of his family are of varying qualities. However, it is easier to create Terrible snow people rather than Passable ones, and so there is never a reason to intentionally create a Passable snow person. 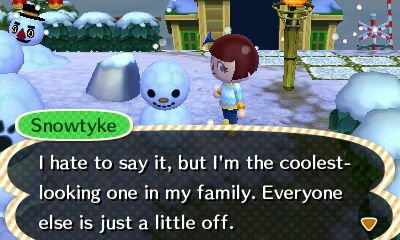 Since Snowtyke’s gifts are dependent on the quality of the rest of his family, it is worth creating his family first. If you inadvertently build a Passable Snowman, Snowboy or Snowmam you can decide whether it is worth quitting without saving, or continuing and aiming for a particular present from Snowtyke. The Snowman is the father figure of the family and is the largest of the snowpeople. He wears a top hat and has two zeroes for eyes. When you’ve built him perfectly for the first time in the snow season, he will present you with a Bingo Card. Once you have that first card you cannot get another until you’ve played and achieved Bingo, and then built another Perfect Snowman. Please note that apart from playing and winning Bingo, you can only get rid of a Bingo Card by time-travelling backwards out of the day, or time-travelling out of the snow season. This means that if you can’t spare a slot in your pockets, or don’t wish to play Bingo, don’t accept the Bingo card when it is offered. Each day, you, and any guests in your town with a Bingo card, will be able to speak to a Perfect Snowman and have him spin his eyes to give you a Bingo number. If the number shows on your Bingo Card it is marked off. You continue doing this each day, and with each Perfect Snowman, until you’ve marked off a diagonal, vertical or horizontal line of five numbers on your Bingo Card. Since five numbers are required to achieve Bingo, you cannot complete a Bingo Card if you’ve built just one Perfect Snowman unless you visit other towns with perfect Snowmen. If you don’t wish to visit other towns it may be useful to build only Perfect Snowmen for a while, giving you four Bingo numbers each day. As long as you have a Bingo Card, all Perfect Snowmen will give you Bingo numbers, no matter when they were built. 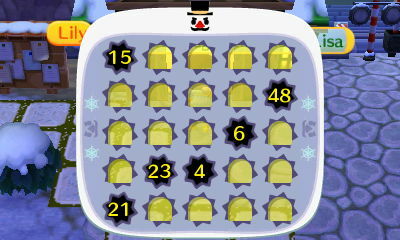 Bear in mind that you cannot get another Bingo Card while you have an active card, so whenever you have any Perfect Snowmen in your town, you should play Bingo with them before building another one. If you achieve Bingo with the existing Perfect Snowmen, then you can build a new Perfect Snowman to acquire a new Bingo Card. If you have an active Bingo Card and build a new Perfect Snowman first before checking the numbers with other Perfect Snowmen, you won’t be able to acquire another Bingo Card that day. 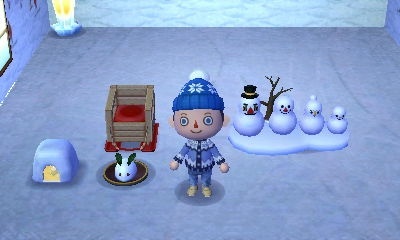 Completing a Bingo Card, either in your town or a friend’s town, results in the Perfect Snowman giving you a random piece from the Winter Sports theme. 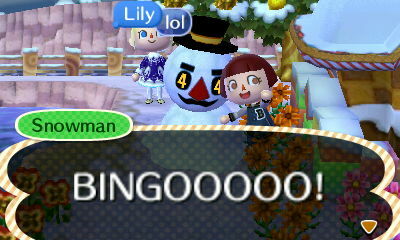 When your character plays Bingo for the first time in New Leaf, the first ten Bingo Cards completed will yield all ten items, without duplicates, and in no particular order. So you can be assured that when you’ve had Bingo ten times, you’ll have all the presents that are available from a Perfect Snowman. Once a player has an entire set or series in their catalog, a Perfect Snowman will give out duplicate items. If you would like to have more than one complete set of the Winter Sports themed items it is advisable to use different characters or players to obtain these. This allows your main character to continue with their quest to acquire items from other snowpeople, and means that your main character doesn’t have to keep acquiring random duplicates when another character can easily acquire the ten items with ten completed Bingo Cards. 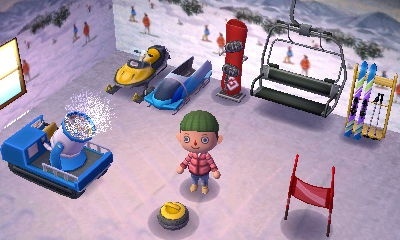 If you intend to use other characters, be sure that they don’t pick up any Winter Sports theme items acquired by another character. This is because anything picked up will show in that character’s catalog and the Perfect Snowman will assume that the items are already obtained, thus making it harder to acquire another complete set in ten completed Bingo Cards. Snowboy has a triangular nose, black eyes, and is the second largest of the snow family. Snowboy’s body size is frustratingly in-between Snowdad’s and Snowmam’s which makes him the trickiest one to create perfectly. Making Snowboy too large will result in a Snowman, and creating him too small will result in a Snowmam. 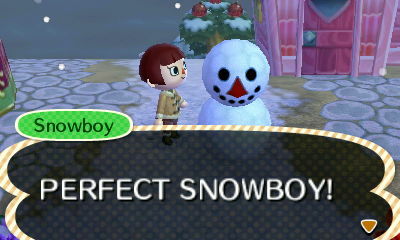 Only when Snowboy is created perfectly will he reward you with a present which will be sent in the mail the next day. Confusingly, the presents he sends are from the Snowman Series. Perfect Snowboy hands out his presents in a random order and won’t give you any duplicates unless, or until, your player has cataloged all 15 items available from him. Snowmam is the mother figure of the family. She has eyelashes, wears her hair in a bun and is the third largest of the snow people. In the section on special snowflakes at the start, it was mentioned that special snowflakes appear whenever it is snowing, and that they are important to Snowmam. In addition to this, from December 11th , when you are able to build snow people, special snowflakes will also appear when it is not snowing – but only when you have a Passable or Perfect Snowmam. Snowmam is relatively easy to create and you can acquire all her gifts in a single day. After creatinga Passable or Perfect Snowmam, she will thank you and tell you how intrigued she is with snowflakes. She will also ask you to catch some for her. 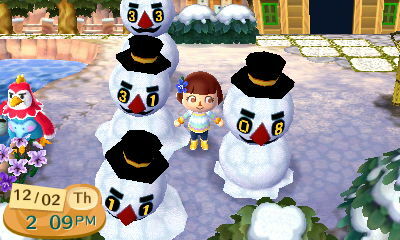 A Passable Snowmam will request 5 snowflakes, and a Perfect Snowman will request 3 snowflakes. Giving the requested amount of snowflakes to Snowmam will reward you with a piece from the Ice Series. However, if Snowmam is Terrible, special snowflakes won’t appear when it is not snowing, and she won’t request any either. Perfect or Passable Snowmam is the only one that gives presents in a fixed order. Only after giving out all her presents will she give random duplicates. However, this can be reset by time travelling backwards out of the current day, after which she will start handing out her items in a fixed order again. The order in which Perfect or Passable Snowmam hands out presents is shown below. You can receive these items both in your own town and towns you visit. Snowtyke is small, cute, has a round nose, and is the smallest of the snowpeople. Snowtyke must be built perfectly. 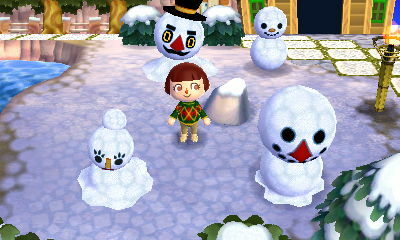 Snowman, Snowmam, and Snowboy must also be present in your town. Snowtyke has only four gifts to give you and therefore needs to be built only four times. 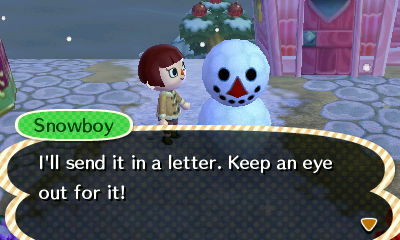 If you ensure that a Perfect Snowtyke has his entire family in your town, you’ll receive a gift in the mail. The gift received will depend on the quality of the Snowman, Snowboy, and Snowmam you’ve built, and not the order in which they’ve been built. There is no particular sequence to follow for creating the entire snow family, and on the first time of building them in a snow season you can build them in any order. Depending on which gift you get, thereafter, it is worth building Snowman, Snowboy and Snowmam first, before deciding on whether you should build Snowtyke. If building him will result in a repeat present then it is advisable to skip building him until you have the rest of his family at other qualities in order to acquire a different gift from Snowtyke. Remember, in all cases Snowtyke has to be Perfect in order to receive one of the gifts below. The family below will earn you a Sleigh. A little off? 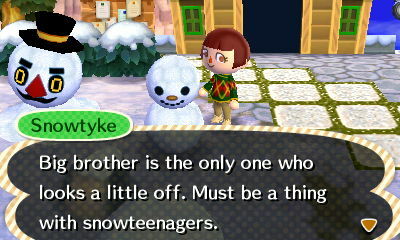 Snowtyke is truly forgiving, because his entire family looks abominable! This family will earn you a Snowbunny. This family is perfect and will earn you a Snowman Matryoshka. You can safely time travel, and nothing will happen to your snowpeople, as long as you stay within the same day which runs from 6am to 6am. You can also time travel days ahead and the effect on the snow people will be the same as if time has passed naturally. So, if you time travel two days ahead, your snow people will have melted the same as if you’d played two days, and if you time travel more than four days ahead, all your snow people will have melted. If you are carrying a Bingo Card it will still be valid as long as you haven’t time travelled past the end of the snow season on the 24th of February . Time travelling backwards out of the day will instantly melt your snow people and cause your Bingo Card to expire. 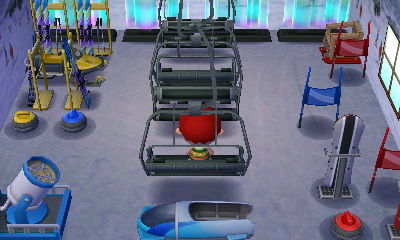 Most of the gifts from Perfect Snowboy, and all of the gifts from Perfect or Passable Snowmam, are sold at Re-Tail for 8888 bells each. Did you notice that the figure 8888 looks like four snowpeople? The high value gifts from Perfect Snowboy and Perfect or Passable Snowmam can earn you a lot of bells, even more so if you have a Wealthy Town Ordinance in effect in your town. To enact the ordinance, use your Mayor character to visit Isabelle at the Town Hall. Sit in the Mayor’s chair to initiate a conversation, choose the Wealthy Town ordinance and pay 20,000 bells. A Wealthy Town Ordinance will give you 20% higher prices when you sell your items, but it also means you will pay more for the items you buy. Of the high value gifts, those from Perfect or Passable Snowmam are definitely the easiest to acquire. Therefore, it is worth having at least one Perfect or Passable Snowmam constructed throughout the snow season so you can earn a lot of bells quickly. For an even higher yield, save up the Ice Series items that you intend to sell and watch out daily for the special offers posted outside Re-Tail. Every day something will be bought by the shop owner, Reese, for double the price she normally pays. There are strong indications that luck very likely plays a role in Snowman Bingo. If your player is the one that makes Snowman’s eyes spin, maximizing your luck may result in him giving more numbers that are present on your card, irrespective of whether you are in your own town or a friend’s town. You can improve your luck in various ways. In your home, you can arrange items according to good Feng Shui by placing Red items to the East, Yellow items to the West, and Green items to the South of your room. In addition, you can consult the Lovely Phone or pay a visit to Katrina. Both will offer advice on which items can be worn to increase luck. The Lovely Phone can be obtained from one of the fortune cookies sold by Redd during the Summer fireworks shows, and Katrina is a fortune teller who occasionally sets up a tent in the Event Plaza of your town. Once you’ve visited Katrina on 20 different occasions in her tent at the Event Plaza, she will set up a shop in your town’s Main Street. Thereafter, when visiting her she may offer you a Tingle Hood or a Celebration Hat to purchase. Wearing either of these will ensure that you avert bad luck or maximize good luck without having to consult the Lovely Phone, or pay further visits to Katrina. Generally, improving your luck is a good idea because it will benefit other areas of your game. When starting New Leaf and visiting Re-Tail, a blue alpaca called Cyrus is seen sleeping in the right hand corner of the shop. Cyrus is the upholsterer and customizes some of the furniture in the game. In order to unlock this character, and access his services, your character will need to have sold 100,000 worth of bells to Reese at Re-Tail, and cataloged or acquired 100 items of furniture and 50 pieces of clothing. Unfortunately, the majority of snowpeople presents aren’t customizable, but you are able to customize the Curling Stone, the Slalom Gate and the Snowboard, all of which are gifts from a Perfect Snowman. The gifts given by snowpeople cannot be ordered from the Nooklings, so ensure you make full use of the snow season and acquire all the items.